Look no further for Fleming’s menu prices. When guests visit Fleming’s Steakhouse, they quickly realize that their obsession to detail ensures that a steak dinner is delivered with perfection. Fleming’s only uses USDA Prime Beef which is either wet- or dry-aged for a specific number of days. Fleming’s steak expertise is paired with its top-rated wines from around the world plus unique local wine selections. The perfect wine enhances the steak dinner. Fleming’s helps guests select the perfect wine to accompany their dinner on a tableside custom app that chooses a wine based on the guest’s meal or mood. Below are the latest Fleming’s menu prices. (Limited Availability) offers a rich, bold flavor with a distinctive nutty note. Three steak spreads - gorgonzola and mascarpone brûlée, sweet onion bacon jam and cabernet-mustard. Only Available on Sunday served with a trio of sauces, includes your choice of The New Wedge, Modern Caesar of Fleming's Salad, one side dish and dessert. Friend of Fleming’s is an email subscription newsletter that guests can sign up to receive. By signing up, guests will receive exclusive offers, the latest news at Fleming’s, and a special gift on their birthday. Sign up is accomplished online via Fleming’s website. In 1998, restaurateur Paul Fleming and Bill Allen opened the very first Fleming’s in Newport Beach, CA. As of 2017, there are 69 locations across the US. Fleming’s Steakhouse is a wholly-owned subsidiary of Bloomin’ Brands International and is headquartered in Tampa, FL. For more information about Fleming’s, visit their official website. 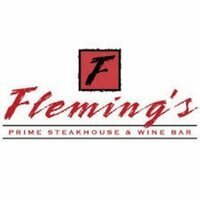 What are the dining room hours at Fleming’s Steakhouse? Dining room hours will vary by location. Please contact nearest Fleming’s Steakhouse to confirm. Does Fleming’s Steakhouse accept reservations? Fleming’s Steakhouse strongly suggests that guests make reservations. Reservations can be made directly on Fleming’s website or by phoning the nearest location. Does Fleming’s Steakhouse sell gift cards? Yes, Fleming’s does offer gift cards. Guests can purchase online at Fleming’s website and send them digitally or via postal service. Does Fleming’s Steakhouse offer rooms for private dining? Yes, Fleming’s does offer private dining rooms with special menus. Guests should check with the nearest Fleming’s location to check for size and availability of rooms.